From the earliest wheeled carts and dugout canoes to self-driving cars, transportation technology has made it possible for people and their belongings to travel far across land and sea. 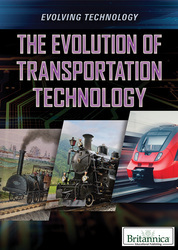 Readers will explore the major shifts in transportation technology and how they relate to broader shifts in different countries, and they will learn of disparities between groups with varying levels of access to resources. Spanning from early developments of the wheel to steam power to the modern age of planes and cars, this book looks toward the future to even greater transit possibilities.